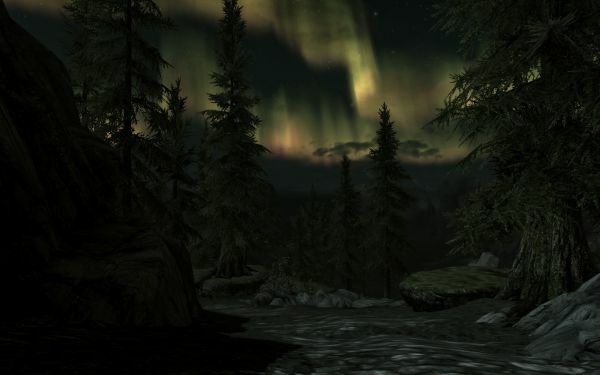 The Elder Scrolls V: Skyrim impresses with new visual effects, such as the norther lights. Luckily it does not have the actual long winter nights of its real-world counterpart, although you may need the Nordic winter cold to keep your computer from overheating if it is too old. This is about computer games, so not particularly important. Since I am still fairly new to The Elder Scrolls V: Skyrim, I tend to compare it to earlier games in the same series, especially its predecessor Oblivion. I actually think the difference from Oblivion (spring 2006) to Skyrim ( fall 2011) is not all that big. They both run on the Xbox 360 and PS3 gaming platforms, as well as Windows-based computers. Bethesda Softworks argue that they know the console platforms better now, so are able to wring more power out of the same hardware. That seems to be true, to some extent. But the Windows version also does allows computers with the newest video cards to show off their capabilities. I find it thought-provoking that the basic gaming platform has not changed in five and a half year. That was certainly not true a decade ago. The change from Daggerfall (one of the last games made for MS-DOS, in 1996) to its sequel Morrowind (Windows and Xbox, 2002) was dramatic. Not only were the graphics superior by leaps and bounds, but the AI was radically improved. The changes from Morrowind to Oblivion and on to Skyrim have been subtle in comparison. It may be true that the capabilities of our computers double every year and a half, but there is little sign of this in the games. Except for the more detailed graphics, especially in the rendered landscapes, both of the latest games could have been made with the technology of 2002. Developers have certainly learned from the earlier games and improved on them, but they hardly rely on technological progress to any great extent. In so far as they do, it has more to do with cheap storage: Skyrim is filled with recorded voice dialog throughout, which would have been considered a luxury with the hard drives of a decade ago, but is barely noticeable on today’s much larger hard disks. The artificial intelligence is more advanced now, it seems, and it is possible that this would have taxed the computers of 2002 beyond what they could handle. Certainly the game world seems more alive and natural now. But it is a gradual improvement. And the change from Oblivion to Skyrim is quite incremental, more a matter of design than raw power. Which makes sense since we are still stuck with Xbox 360 in 2011. Who would have thought it? This entry was posted in computers, games by itlandm. Bookmark the permalink.